A field of potential Sydney Cup hopefuls face off in the 2018 Chairman’s Quality this Saturday at Randwick Racecourse, betting on the staying showdown led by Alward. Alward is the clear favourite in 2018 Chairman’s Quality betting this weekend at Royal Randwick on way to the Sydney Cup over two miles. Photo: Steve Hart. Set to run as Race 5 at 1:55pm (AEST) on Day 1 of ‘The Championships’, the Group 2 $300,000 Schweppes Chairman’s Quality (2600m) has drawn a final field of 17 hopefuls. The race offers a ballot exemption to the winner for the following weekend’s Group 1 $2 million Sydney Cup (3200m) over the two miles and Grand Marshal (3rd in 2015) was the last Sydney Cup winner to come off the Chairman’s Handicap. Grand Marshal was the second Chris Waller-trained Sydney Cup winner following the master trainer’s other upset win in 2011 with Stand To Gain who was also a Chairman’s Handicap graduate (10th). This year has just the one Chairman’s Quality hopeful, Alward leading the markets at Ladbrokes.com.au paying $4 to salute from barrier 11 with dual Sydney Cup winning jockey Kerrin McEvoy to ride. 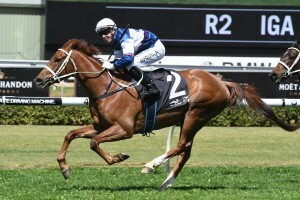 An in-form son of Aqlaam, five-year-old Alward has run top three in his three runs this campaign, the latest of which was a close second behind Master Of Arts in the Group 3 NE Manion Cup (2400m) at Rosehill on March 24. Despite his winning form only extending to 2000m, Alward is tipped as the horse to beat over the 2600m in the Chairman’s and is also an $11 fancy in futures Sydney Cup odds. There are just two other single-figure hopefuls in the latest Chairman’s Quality odds with Alward’s last start conqueror Master Of Arts ($8.50) and Peribsen ($8.50) drawn in barriers six and eight respectively. Darren Weir saddles-up the 57.5kg second heaviest weighted horse in the race, six-year-old grey Master Of Arts looking for back-to-back wins. Unlike Alward who needs to prove his effectiveness over the distance, Master Of Arts boasts two wins and a third from three previous goes at the 2600m. He does however rise two kilos from his NE Manion Cup winning weight so will need to be improving if he is to win and firm in from his current quote of $15 in all-in Sydney Cup betting for Saturday week. Better weighted for Saturday in on the 53kg minimum is the John O’Shea-trained Peribsen, also paying $15 in pre-field Sydney Cup markets, who is the other best NE Manion Cup graduate in the mix. Third to Master Of Arts last time out, the Lonhro entire has won up to 2800m so the extra trip this weekend should suit and he drops a kilo making him an attractive place chance again. The early market mover meanwhile is another 53kg lightweight, Ormito ($12 into $10) coming off five straight place finishes. The other Weir runner in the mix along with Master Of Arts, this consistent German-bred Mamool five-year-old was last see catching the eye when second to Fanatic in the Group 2 Adelaide Cup (3200m) over two miles on March 12. Prior to that he ran in the money in three Melbourne black-type races and he has trialled well at Cranbourne since the Adelaide Cup to bring him on fitness-wise. The Adelaide Cup winning Lindsay Park-trained mare Fanatic is also a $10 chance in the Chairman’s as is her Australian Cup placed stablemate Ventura Storm carrying the 59kg top weight. See below for the full Chairman’s Quality 2018 field, barriers, jockeys, weights and latest Fixed Win racing odds for the Sydney Cup lead-up open now at Ladbrokes.com.au.